With the release of NBC's Kings just weeks away, the show's director Francis Lawrence (I am Legend) has signed up for another futuristic Bible adaptation. Variety is claiming that Lawrence has signed up with Warner Bros. to make Samson "a futuristic retelling of the Samson and Delilah story." Scott Silver (8 mile) will be writing the script with Erwin Stoff producing. Thanks to Peter Chattaway for this one. Oh and Kings will now première on Sunday, March 15, at 8 pm, not Thursday March 19th as previously stated. 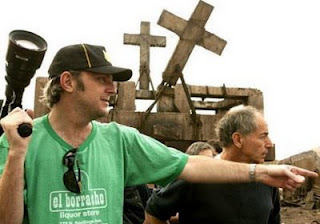 I mentioned a fortnight ago how plans to shoot the film Kingdom Come in New Zealand had been put on hold. Thankfully, stuff.co.nz is now reporting that filming is finally due to start "late next month". The article also claims that "a deal (has) been negotiated with one of the six major studios for worldwide distribution of the film." Thanks to Doug of Church Video Reviews for the tip off. My article on Bryan Singer's Valkyrie is up at ReJesus. I still have a number of my reviews for the old site to reload. If anyone has been trying to track then down without success - apologies. If you let me know which review you were after I can try and prioritise reloading those. Last week I asked if anyone knew where this film Jesus had come from. I was pleased at just how quickly I got a response. The answer is that the footage is taken from the video to Michael W. Smith's 1988 song "Secret Ambition" from the album "i 2 (eye)". It took me a while to find the precise year but the video's hilarious mullets, waistcoats over vests, lead guitar solo and moustachioed Pontius Pilate somewhat give the game away. Special thanks to Tom Newman as Jesus and the Church on the Move, Tulsa OK. Filmed on the set of the Great Passion Play, Eureka Springs, ARKANSAW. Those who, like me, had (mercifully) never seen this video can catch it at YouTube. Murder in the Miracle Maker? So Nina and I watched a bit of The Miracle Maker over the weekend and I noticed a few new things this time around. The first of which was this rather odd-shaped package that Peter seems to have with him. Not sure whether this is meant to pre-figure Jesus's death and his body being wrapped in preparation for his burial, or it's a variation on "pick up your cross and follow me" or whether it's just that someone made up a parcel that just happened to be body shaped. I suspect the latter. On a more serious note, I was also struck by the suddenes of Jesus's transition from teknon to spiritual leader. He starts the film as a builder/carpenter, and then goes, seemingly leaving his employers somewhat in the lurch. Then he goes home to his mother, she remembers his childhood, and the next day it's off to the River Jordan to get baptised. Speaking of which, the last person to get baptised before Jesus is Andrew, who, like Jesus, baptises himself. Andrews role is beefed up a bit in this film compared to other Jesus films, so maybe this is part of that. Lastly, Mel was struck by how upset Jesus is after his cousin John is beheaded, particularly given that he is seeing miracles happen in his own ministry. In fact, this is made even more poignant given that this film not only has more miracles than the majority, but also by the fact that it is called The Miracle Maker. He saved others, but he himself could not save those near to him. Through the Bible in Five and a Half Years has got as far as Isaiah - a book whose poetry far outweighs its narrative. 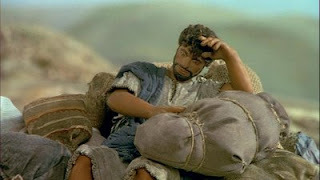 So it's hardly surprising that Isaiah has never been made into a film (even though Jeremiah was in 1998 by the Bible Collection). But given the significance of Isaiah's work on the New Testament in particular, it's strange we don't find more of him somewhere. All there is is about ten minutes of a Living Christ episode where the story from Isaiah 36-37 appears by way of introduction to the prophet and his writings, which in turn introduces Jesus, whom the series is really about. But that is all. 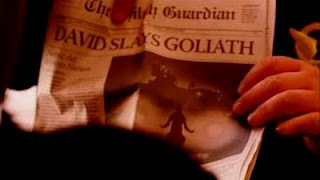 It does, however, give us one of the best shots of the whole series (above) as Isaiah paces about behind his scribe. Does anyone else know of a film that features Isaiah? Peter Chattaway has posted a piece on German studio UFA Cinema who are adapting a best-selling romcom and a quirky comic book both of which involve biblical characters. Jesus Liebt Mich (Jesus Loves Me), "sounds sort of like a cross between Hal Hartley's The Book of Life (1998) and the Gretchen Mol segment in David Wain's The Ten (2007)." Prototype is comic book which appears to be a subversive take on the creation story. Looking at the blurbs for the book on Amazon Germany the plot seems to involve Adam rebelling against both God and the snake, but the translation is less than clear. There's a little bit on this at the Hollywood Reporter. 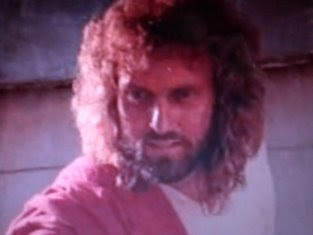 Who is This (Film) Jesus? My friend Thomas Langkau emailed me last week about some footage he'd seen on this YouTube video. 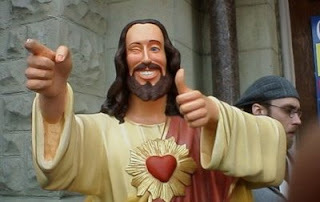 It's a montage of different film Jesuses set to music. The first few actors are obvious enough Brian Deacon, Robert Powell, Max von Sydow and Bruce Marchiano. But the final few scenes are taken from another Jesus film and one I'm not familiar with. 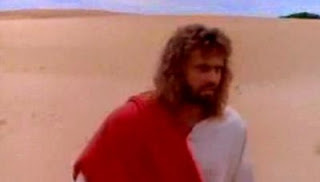 The period would seem to be the late seventies, the eighties or possibly the early nineties, but this was the leanest of all periods for Jesus films. Of those that fit the time frame, it's obviously not Last Temptation, Jesus of Montreal or The Day Christ Died. I had three other ideas - The Testaments of One Fold and One Shepherd, In search of the Historic Jesus or the French film - Deux heures moins le quart avant Jesus-Christ, but from the small number of images and footage available on the web, it looked like this was still another film. My guess is that it is some church sponsored project - although it may be something made for one of the minor television programmes. 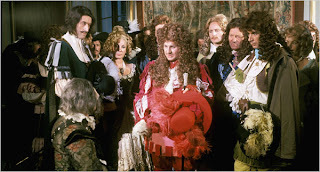 So I'd be interested to know if anyone does know what this film is and if they know how I can get hold of a copy - if only to behold that perm in all its glory. My friend Stu Jesson has posted this summary of his favourite film (apparently inspired by the Volkswagen "see film differently" ads). Does anyone know this one? My absolute favourite film is that one about the guy who gets born on Christmas, and thinks he’s special, and when he’s older he decides to try to be king. Except that first he has to fulfill all these ancient prophecies. So he marches around the villages, searching for these three things that got hidden by some wizards years ago – gold, frankinsence and murr, and meets these other guys on the way. They don't like him at first, but after he beats the big one up in the middle of a river, they make friends, and build these wicked houses in trees. Once he’s found the things the wizards hid, he takes them to a lake in the middle of a storm. When he drops them in, the storm stops straight away, which is one of the prophecies. So then he jumps on a donkey and rides into the city to become king. But before they let him be king, he has to starve himself for forty days and then escape from a cave with a massive stone in front of it. Some eagles come and help him, I think, and then they have breakfast. Er...quite. Fans of the Colbert Report might be aware of his Captain Jesus Hood piece which is sadly unavailable in the UK (so neither Stu or I have any idea what it contains). Roberto Rossellini took one of the strangest paths any director I know has. Having almost single handedly popularised Neo-Realism with Roma Città Aperta (Rome, Open City) (my review) he eventually made a deliberate move to television seeing it as the ultimate medium (for reasons I forget). It was here that he produced a number of historical films including Atti Degli Apostoli (Acts of the Apostles) and Il Messia (download my podcast). It was a move that remains largely misunderstood by film lovers, to the extent that Wikipedia (and a good many contemporary accounts of his career) gets as far as his affair with Ingrid Bergman and then stops. Fortunately, the good people at the Criterion Collection know a good deal more than most, and they recently released a collection of his historical TV films on DVD. Sadly neither of the above titles are included, but as the collection is titled Rossellini's History Films: Renaissance and Enlightenment we can but hope that there might be a future series called Rossellini's History Films: The Ancient World (or something similar) which might also include his works on Socrates and Augustine of Hippo. Actually we can do more than that. Criterion have a "contact us" page with a specific email address for sending in suggestions. To which I will shortly be turning my attention. This is actually part of Criterion's Eclipse series. Thanks to Peter Chattaway for the link on this one. 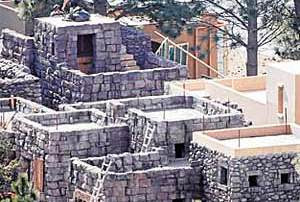 He also links to an article on this set by Dave Kehr at the New York Times. Sets for Kingdom Come have already been built in several locations including Lake Benmore in the central South Island and Wellington, but crews have had their Christmas break extended until January 19 as the film executives try to keep the production on track. It is understood investors are nervous because US networks have been reluctant to buy the film from Wellington-based production company South Vineyard. 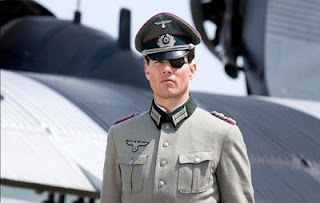 Tim Coddington, an Auckland-based producer who has been working on the film, said the project might still go ahead. "We're just on an extended hiatus while they have some script rewrites done and sort through their financing things." Casting director Liz Mullane said she was "fully optimistic" that everything would go ahead, but was unable to comment further. Whilst I remember, stuff.co.nz also posted some production information on the film over Christmas. 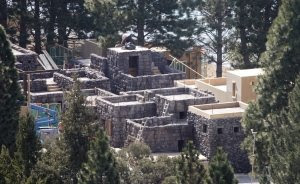 The picture above is of one of the sets for Capernaum. I watched Junebug again last night and appreciated it even more than I had first time I watched it. 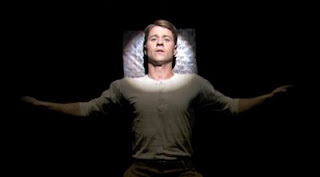 This time around I was particularly struck by the performance of Ben McKenzie as Johnny. So I looked him up on the IMDB and noticed that he recently worked on a new version of Johnny Got his Gun. From the official website it seems that this is effectively a one man show filmed and released as a movie, and it looks like a DVD will be released around April. I've never read the book, but I watched and reviewed the 1971 film adaptation about a year ago. 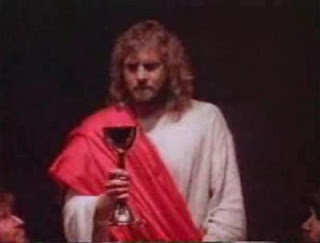 That version of the story featured a couple of scenes with an imaginary Jesus, but was also a fairly loose adaptation of the book (despite being directed by the novel's author Dalton Trumbo). The new version claims that about 99% of it is taken from the novel, so, at the very least, it's likely that it will contain the scene with Mary, Joseph and Jesus. I didn't manage to find the scene where Jesus plays cards with a group of soldiers in this set of crib notes on the book, so I guess they were added for the film. That said the shot above perhaps suggests that something about Jesus will fit in somewhere. Peter Chattaway caught this one over the Christmas period, so I thought I'd post it up now things are back to normal. IGN has new of the new special edition DVD and Blu-Ray releases of The Robe. I've read various comments on this film by Martin Scorsese over the years, so I was fully aware that he was a fan, but even so that's a bit of a coup for Fox. Amazon.co.uk lists the Blu-Ray version as having the same release date, but there doesn't appear to be a corresponding UK DVD release. According to the official website for NBC's Kings (see my previous posts), the 2 hour pilot will broadcast on March 19th 9pm/ET. There's also a teaser trailer - although it doesn't feature any footage from the show. There's also a somewhat novel promotional feature - a fake news website from the programme's parallel world, which itself leads onto a history of "the Royal Kingdom". It's here where we finally get to see a few shots from the series itself and there's a bit of background information as well. I'll be keeping an eye on the site over the next couple of months, and hopefully there will be an opportunity for me to review it when we come to the middle of March. 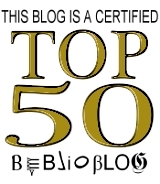 I'm a Top 20 Biblioblogger! For December anyhow - somehow I've gone from number 56 to number 20. I'm greatly encouraged by this actually. At times I've felt a bit on the margins of the Biblioblogging community (as I suppose "film" is), so it's nice to get some recognition. The thing is though, that I'm not really sure why I've had this sudden jump, and suspect that it might not last for long. I guess I'll find out in February. Thanks to NT Wrong for his hard work on this.